Yesterday’s Google doodle reminded me (and Internet searchers everywhere) that it was Antoni Gaudi’s birthday. I meant to repost these but I fail. 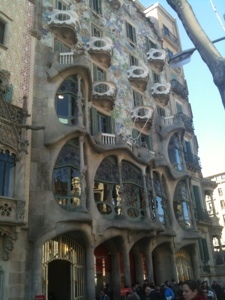 So here they are, a day late, a couple photos of Gaudi-designed things from my Barcelona trip last year. 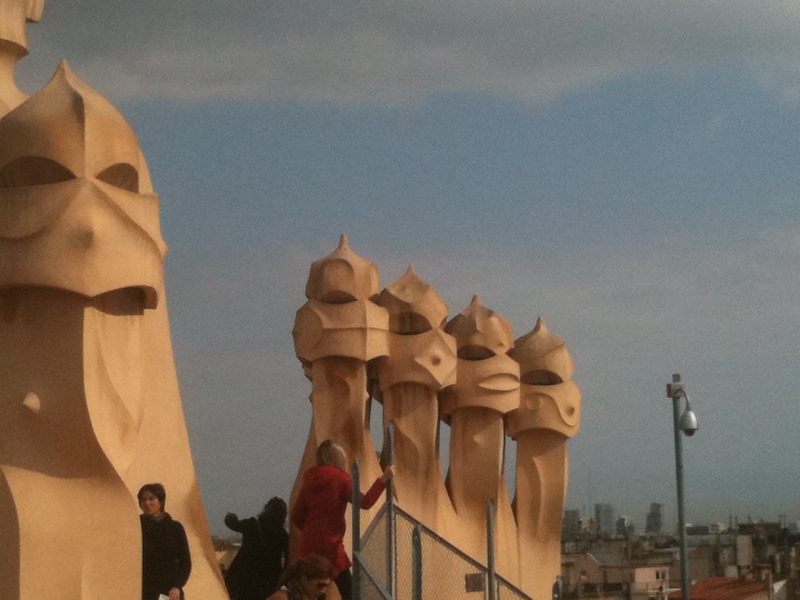 Vents on Casa Mila, the Sagrada Familia, and Casa Batllo. + It’s the Fiesta de San Fermín. (How do I get the accent to work when I’m typing directly in WordPress?) Check out this gorgeous photo by Mike Randolph. No bulls or crazy running men, but a lot of San Fermines gathering. Time has a slideshow, but none of the photos are as good IMO. ~ Is it appropriate for tattoos to be considered in a visa or LPR application when those tattoos are traditionally affiliated with criminal gangs? The WSJ writes about it today. – The last few episodes of NYC-22 that were filmed are being aired by CBS and then made available for viewing online (not sure how long that’ll last). I feel somewhat ambivalent about the show (unoriginal) as a whole but am entertained by Stark Sands in the Crossing the Rubicon episode: shout out to Tunny? He and Adam Goldberg have great chemistry, and I love how they break out a Sharpie to draw tattoos on McLaren when he reveals that he’s an ink-virgin. A while back I added Mike Randolph’s photos of Spain to my feed. 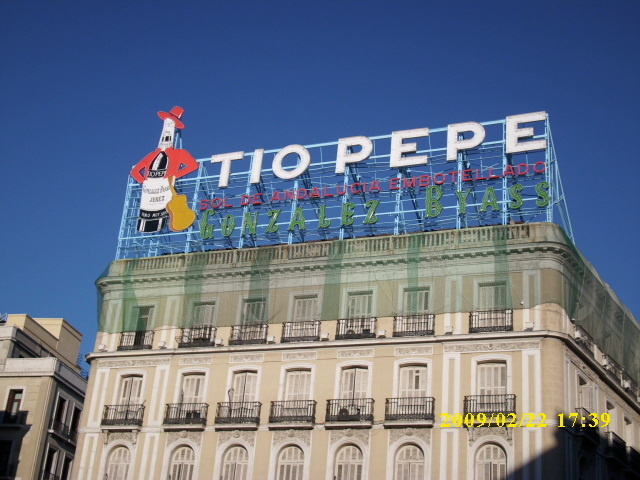 I especially loved the photo of the Tio Pepe sign. I think I mentioned in my travel recap post that the sign was missing from the Puerta del Sol in Madrid on my trip this past February; the roof of the building looked oddly naked without it, despite being shrouded in scaffolding. Apparently may not be reinstalled after the renovation of the building. And here is the same building this past February, signless. Apparently I didn’t take a photo of the naked building, although I definitely remarked upon it in my travel journal. I’ve got a photo of the Mezquita in Cordoba in black and white that I took a while back (maybe in 2002 or so? ), but it doesn’t look nearly as good as his — imagine that! Hmm, I should find the digital back up of the photo (not on this hard drive but on disc, I think). Sort of but not really related: a couple of weeks ago The Economist reviewed La Roja: How Soccer Conquered Spain and How Spanish Soccer Conquered the World. Which seems prescient in light of La Roja’s EuroCup2012 win over Italy yesterday. 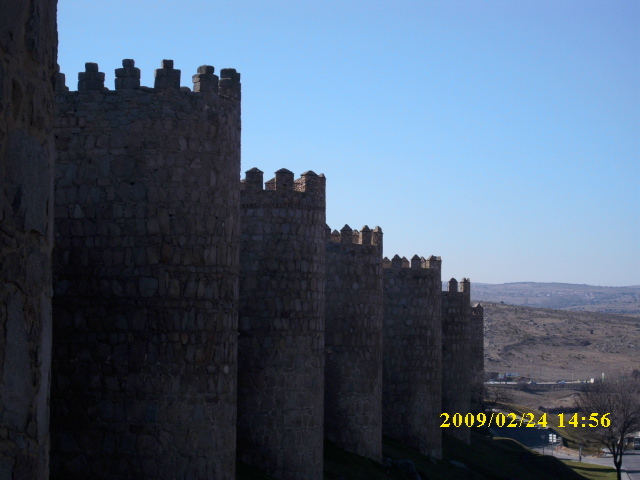 Medieval wall around the old town center of Avila, Spain. Although the original photo remains my favorite view, I love that in the photos from the more recent trip you can see the development going on in the area outside the center, and that you can climb up and walk along the wall. The longer I go without writing up a travel narrative of some sort, the less likely it is that anything will be written at all. I’ve got all kinds of notes in my travel moleskine, but they don’t count really. 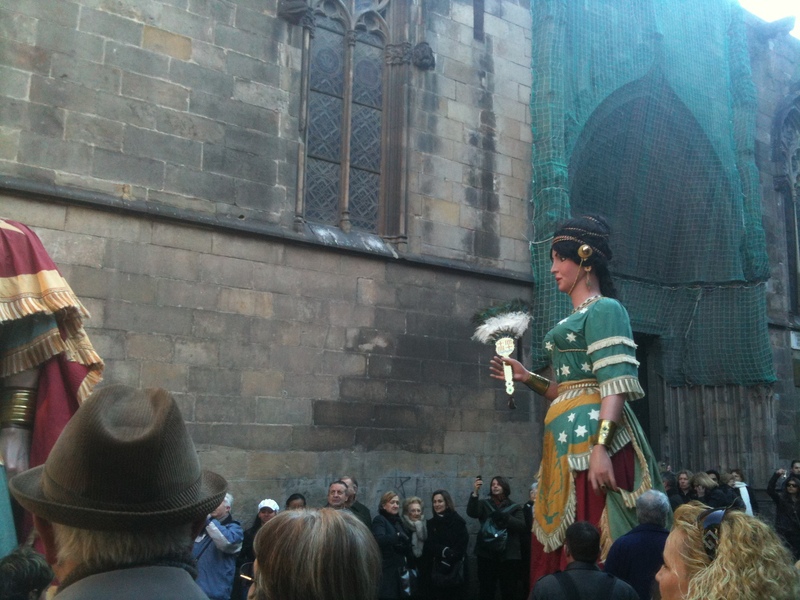 While I had a general idea of things that I wanted to see in Barcelona, I had no itinerary or set plans. Generally, on non-beach vacations in which I go to a destination, I do research in advance and compile a list of things to see/do, and then let circumstances dictate the order in which I see them (or not). In this case, circumstances (also known as the perfidy of PHL and USAirways) dictated that I lost a day due to flight delays and missed connections, and also that my luggage arrive forty eight hours after I did. My tentative plan to take a day trip to Figueres, Sitges, or Montserrat was lost with that extra day. Oh, well, that just means I’ll have to go back, right? 🙂 I did get to tick off most of the big ticket items on my list though: the Picasso Museum, the Sagrada Familia, the Olympic stadium, various works by Antoni Gaudí. Baltimore to Philadelphia to Heathrow to Madrid. The Iberia Airlines fellow who had to deal with those of us whose luggage was left in Philadelphia by USAirways (!!!) was very patient with both the problem and with my Spanish. Took the Vueling shuttle on to Barcelona. Both Iberia and Vueling fly out of the new Terminal 4 at Barajas; it is quite lovely architecture/design, but a long haul from the other terminals. Landed in Barcelona and took the bus downtown to the Plaça de Catalunya and then walked to the hotel. It was after 10pm and I’d been awake for more than 24 hours at that point, so I was out like a light. Sunday: My tentative plan was to find breakfast, and then check out the Museu de Calçat (Shoe Museum) and Museu de la Xocolata (Chocolate Museum). Walking down Passeig de Sant Joan toward the Arc de Triomf, stopped in at Forn Oriol and had a lovely croissant and cafe con leche. (Drinking coffee is something I only do while traveling; I couldn’t say why exactly.) Anyway, I passed the Chocolate Museum and decided to scope out the Shoe Museum first and save the Chocolate for the afternoon. Walking toward the museum, which is located near the cathedral, I ran into a parade of sorts: groups of school children and parents marching along, playing musical instruments, accompanied by figures. They aren’t floats but are structures that a person carries, and they are known as Gigantes. The streets in that area are pretty narrow, at least in terms of accommodating regular pedestrian traffic as well as a parade. After some delay and a wrong turn, I found the Shoe Museum…and it was closed for renovations. Wound up making my way back to the cathedral square and into the cathedral, which was emptying after the end of morning services. Beautiful internal flying buttresses. The crypt of Barcelona’s patron saint, Santa Eulalia, is below the altar, but there was a very long line. 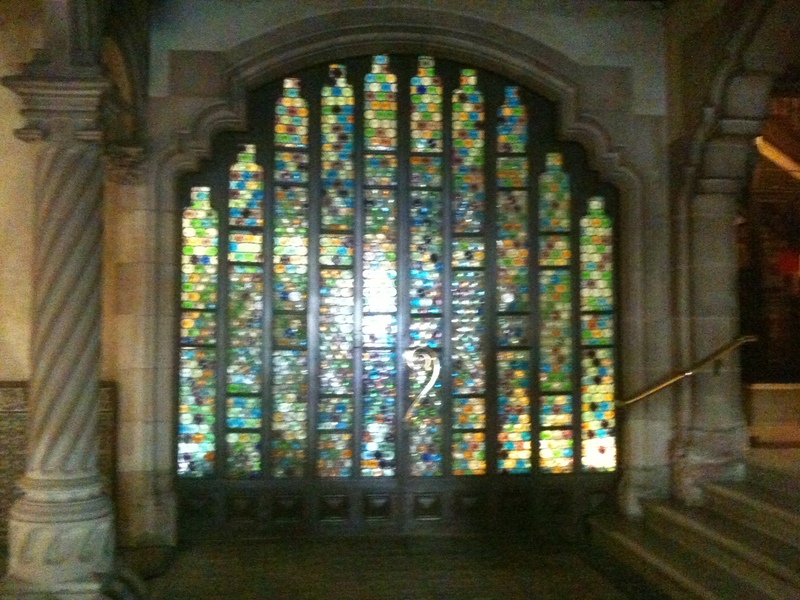 Rather than join the queue, I admired the stonework and stained glass, and then made my way back outside. In the plaza in front of the cathedral a stage had been set up and many, many people were gathered to watch. Different groups of school children in costume performed dances and played music. Next to the stage, several rows of tents had been erected, and various artisans were selling jewelry, candy, ceramics, leather goods, and handmade children’s clothing of natural cotton and wool. I watched a glass jewelry artist demonstrate his craft, and admired the gorgeous ceramics of Pau Costa. The Museu d’Història de la Ciutat (City History Museum) was nearby; it wasn’t on my list but the sign caught my eye. 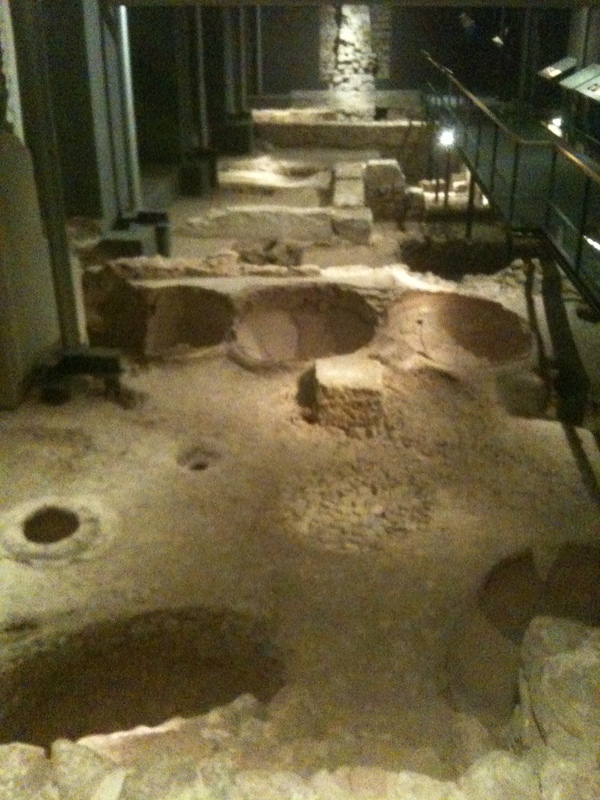 Am glad I entered — this museum is all about the city’s history as a Roman outpost in Spain. Instead of going up, entrants go down to the excavation below the building, where mosaics, chambers, ancient walls and roads can been seen. I particularly loved the wine-making section, with its various vats, and one area in which the pattern of stonework looks like parquet flooring. Then the Museu de Frederic Mares. I don’t really know what to think of Mr. Mares, except that today he would be considered a hoarder. His collection includes loads of pipes, glasses, cigarette cases, keys, ironwork, sculpture, theater programs, playing cards, menus, cigar bands, fans, etc. The ground floor is devoted entirely to sculpture; the collection of crucifixion sculptures is a little morbid; the rooms are lit by motion-sensitive fixtures, and I found it quite creepy to be suddenly plunged into darkness among the JCs who had been separated from their crosses. Going up, you can see a variety of collections, as well as a study with a sizeable book collection and more scultpure, this time more modern. Monday: One of my colleagues is planning on taking a Mediterranean cruise leaving from Barcelona next year, and asked me to scope out the W Hotel for her. After breakfast at Forn Oriol again, I walked through the Arc de Triomf and the Parc de la Ciutadella and along the edge of the La Barceloneta neighborhood, admiring the marina, until I hit the beach and could see the W in the distance. Lots of seafood restaurants — poor planning on my part, none of them were open to try 😦 Then the long walk to the Museu Maritim, which is under renovation right now, but even the partial visit was good if you are interested in Barcelona’s history as a sea port and also the history of the shipping/sailing business. Then up Las Ramblas: kind of tacky and over-touristy. Worth walking up once only , unless you are interested in visiting the opera or the Boqueria. 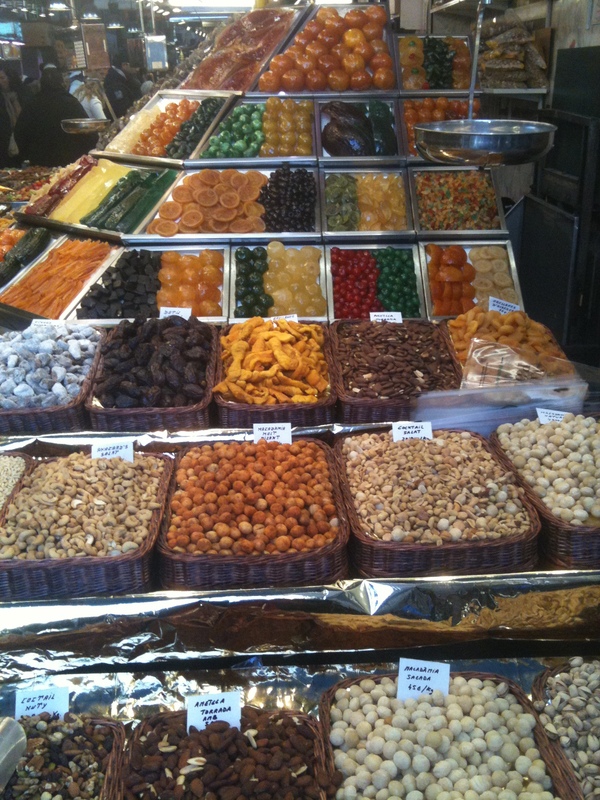 The Boqueria was a madhouse, full of tourists and of regular people shopping for food. The butcher stalls had beautiful cuts of meat, many that are not found in the average grocery store in my area: tripe, pigs heads and feet, kidneys, etc. The fruit and vegetable stalls almost all sold small cups of freshly squeezed juice, and I enjoyed the mango with orange. 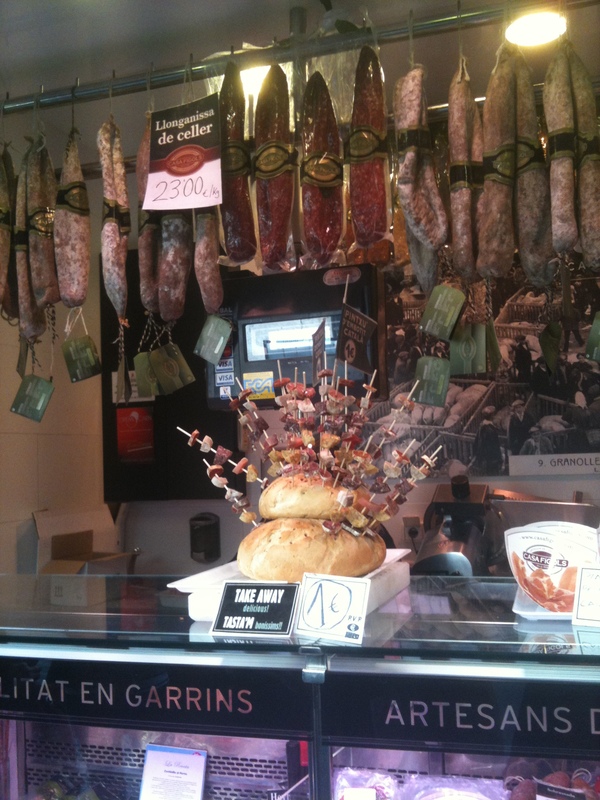 Right at the entrance, one sausage/ham vendor sold pintxos — meat lollipops of different types of ham and sausage. Yum. Sausage and ham stall at the Boqueria. Walking up Avinguda del Portal de l’Àngel, several jewelry and craft stalls were set up, including the glass jewelry maker who’d demonstrated his craft on Sunday. 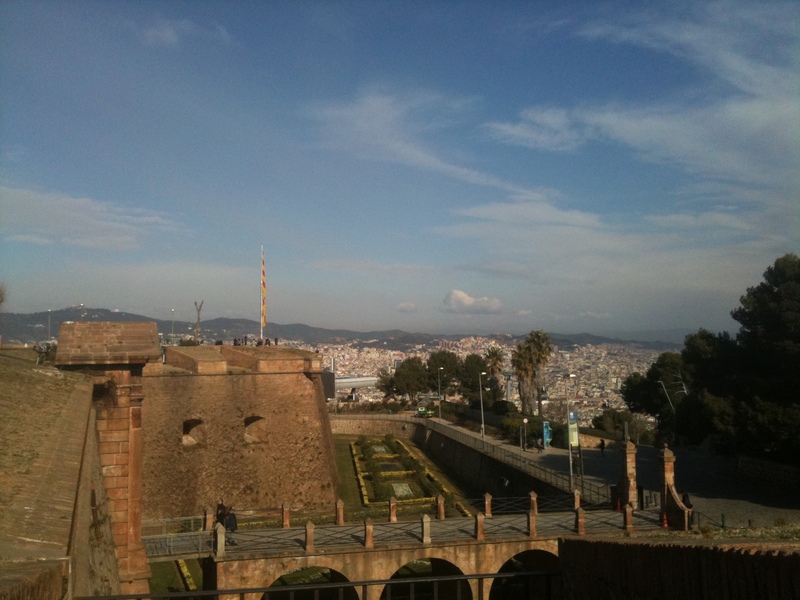 Tuesday: Took the bus up to Montjuïc in the morning and spent the entire day there. The bus doesn’t go all the way to the top, where you can find the Castell de Montjuïc, but you can walk up. It’s good work for your quads and your lungs…or it was for me. If you have any sense (unlike me), you’ll take the funicular up from the metro station. The view of the port and the rest of the city is gorgeous, and the fortifications have nice grounds and a small display on the history of the Spanish Air Force. Taking the funicular down, it’s a short walk to the Fundació Joan Miró and then further on to the Olympic Stadium and a small sports museum. Along the way, you cross a small walk of fame where the footprints of Lance Armstrong, Alberto Tomba, Pau Gasol and Rafael Nadal can be seen. This doesn't look like chocolate, does it? A model of the sculpture from the Parc Güell. 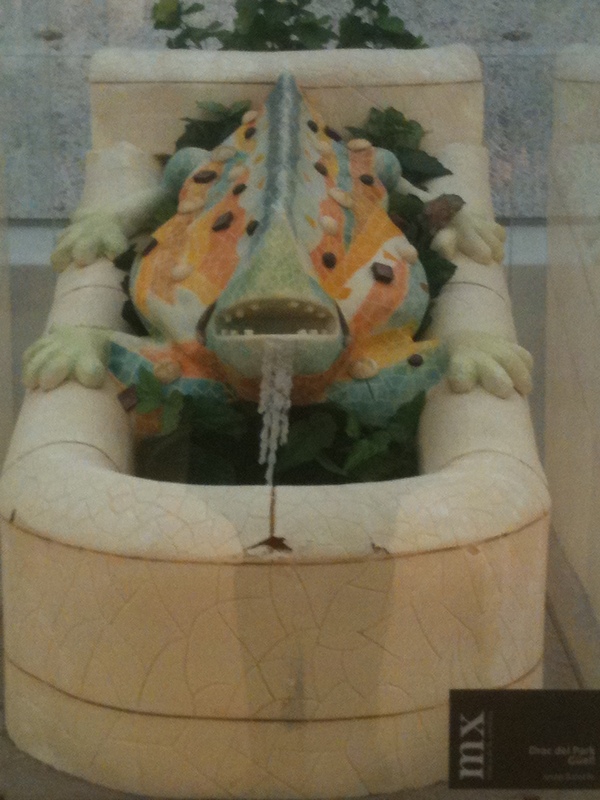 Wednesday: At last, I made it to the Chocolate Museum! It’s relatively small, but takes a couple of hours to get through because of the number of displays and several short videos covering the history of chocolate, its social and political effects on Barcelona and Spain, and its manufacture. Sprinkled in among the more standard museum-like displays are some amazing chocolate sculptures with a wide variety of subjects ranging from Barcelona itself, to the Sagrada Familia, movies, Don Quijote, a bullfighting scene, cartoons, and religious figures. There’s an amazing Pieta in chocolate even! 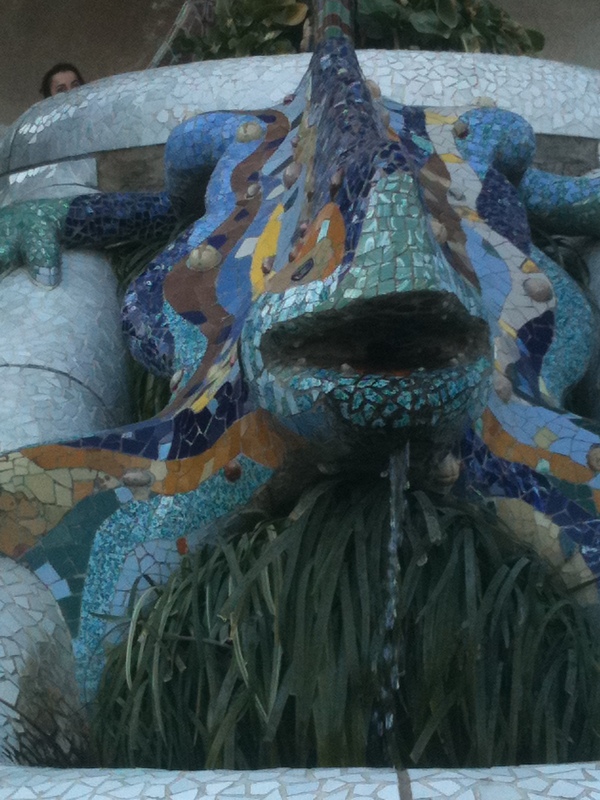 I liked the model of the dragon of Parc Güell. The Picasso Museum is worth visiting if you are a Picasso fan, I think. I can appreciate his later work but actually like his earlier work more, especially the two portraits of women in mantillas. It interests me, though, that he did his own iteration of Las meninas. There’s a textile museum and a precolombian art museum in the same neighborhood, which I meant to visit but never made it back to. Also in this neighborhood is the Church of Santa Maria of the Sea, a smaller church with lovely gothic interior. It looks dark and dour from the outside but is surprisingly light inside. The ceiling is still marked from a fire early in the 20th century. Thursday: Thursday was the day for Modernisme. First to the Block of Discordon the Passeig de Gràcia. I find the exterior of Casa Batlló to be somewhat disturbing – all the balconies look like masks to me, like faces looking out from the building. Loved the stained glass wall of Casa Amatller. 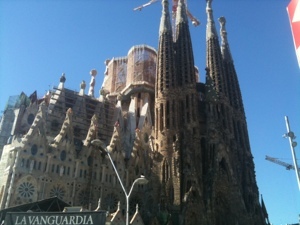 Then on to the Sagrada Familia, which is huge and awesome (in the dictionary sense of the word). The nativity facade is so incredibly ornate and busy, and it contrasts amazingly with the passion facade…which makes sense since they were executed by different people. The stained glass is gorgeous, as are the corkscrew stair cases, and medallions on the ceiling, and the columns that fly up toward the roof like young trees. After admiring the church and going through the display in the basement, I headed up Avinguda Gaudí toward the bus stop to get up to Parc Güell, being too lazy to hike that far. Stopped for lunch at a cafe. Had the fish of the day. The waiter warned me that it was boquerones, a word I recognized as one I should know but could not define. Sardines. They were quite good — breaded and fried so they tasted crunchy and salty — and reminded me that I should keep an open mind about things and not just assume I won’t like them. Because if I had remembered that boquerones meant sardines, I’d’ve gotten the pasta instead and missed out on a tasty meal. The bus to the park included some scenic views. I was very impressed by the driver’s skill at maneuvering the vehicle up and down narrow, one-way streets that were cramped with parked cars. You are dropped off near the top of the park and can walk up or down. I did both, and very much admired all the tile work on the benches, and the ginger-bread-like appearance on the buildings at the base of the park. The real dragon sculpture of the park. Friday: Had to walk by the Mercat de Santa Caterina, if only to admire the colorful roof in person. Once again was struck by the number of bicycles, mopeds, scooters, and motorcycles in Barcelona. Seemed like there were many more of them than cars, and people of all ages could be seen riding them. Then on to the Palau de la Música Catalana, which was absolutely worth the price of admission. The guided tour was in English, but the guide spoke French, Catalan, Castilian, and some Italian as well, so he answered questions in a variety of tongues. 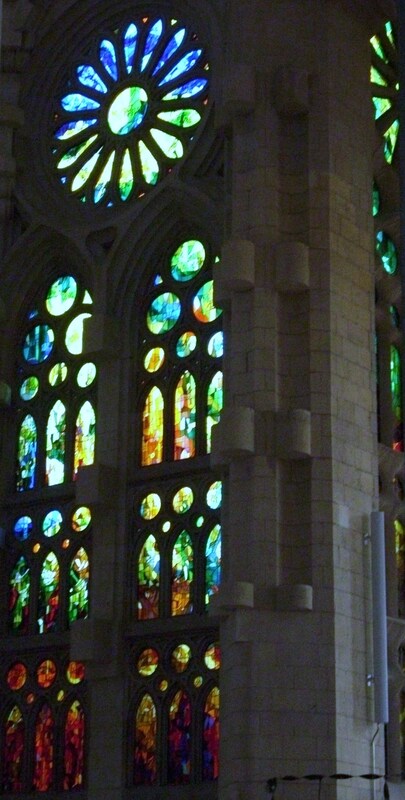 The stained glass was breathtaking. This was an almost accidental stop — not entirely because you have to buy a ticket in advance — but wasn’t on my original plan, and it turned out to be my favorite sight of all. Just utterly gorgeous. And then to visit Casa Milà, also known as La Pedrera, an apartment building designed by Gaudí. The public areas include the roof, which has a variety of levels and very distinct furnace vents; the attic, which is ribbed almost like the hull of a ship (inverted) and has a museum-like display of Gaudí’s work and furniture; and a model apartment of a middle class family from the early part of the 20th century. 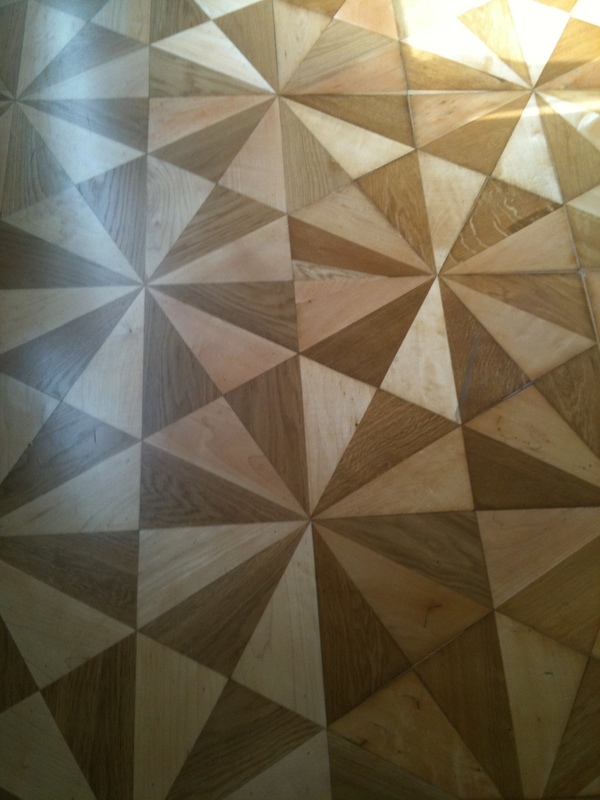 I especially admired the hardwood floors in the apartment, which had a variety of patterns, and much of the furniture, which was very Art Nouveau. 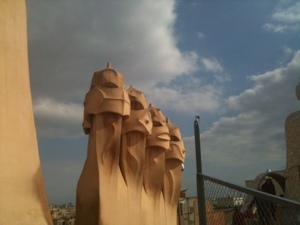 Sculpted furnace vents of La Pedrera. A little creepy and mask-like IMO. Saturday: Walked up the Paseo del Prado and observed very long line to get into the museum at opening, and more people queuing. Walked on to the Museo Naval, which was quite interesting. Although it overlapped a little bit content-wise with the Museu Maritim, it focused more on the state-owned navy and colonies rather than shipping as an industry. Then to the Puerta de Alcalá where I hopped the metro to Puerta del Sol. Did some people watching, didn’t buy a pair of shoes that I’m now regretting (purple crocheted heels with large ribbon at the back of the ankle), walked up Calle Mayor to the Plaza, then bought a slice of the brazo de nata from La Mallorquina and took it back to Retiro Park to enjoy in the sunshine. Watching the joggers and football players in action made me feel vaguely guilty that all I’d done was walk all day…but not guilty enough to join them 😉 After enjoying the sunshine for a while, I headed to the Museo del Prado for several hours. The more often I see Goya’s Family portrait of Carlos IV, the more I appreciate it. And the same for El Greco’s Caballero de la mano en el pecho. 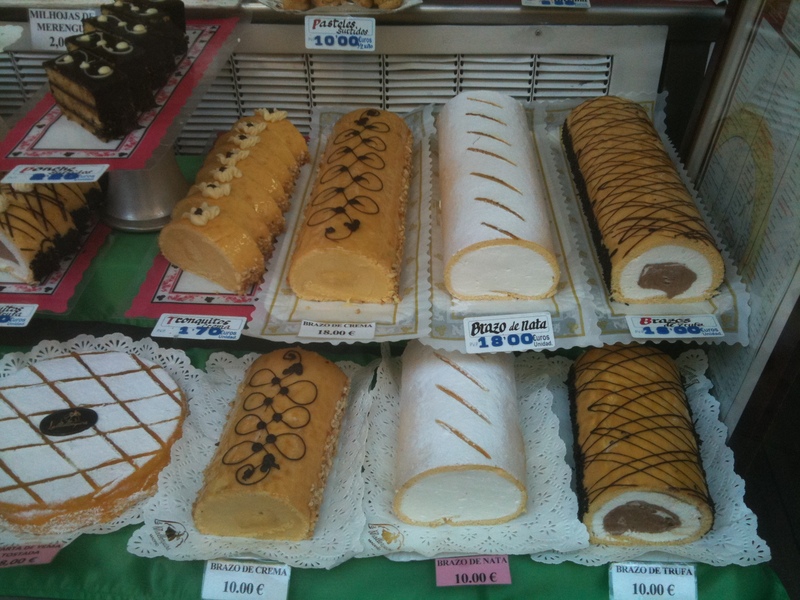 Food: As I mentioned earlier, there is an abundance of cafes, bakeries, and bombonerias in Barcelona. In addition to Forn Oriol’s lovely croissants, I enjoyed the palmeras at El Molí Vell (photo) and ogled the sweets at Fargas and La Colmena. In terms of dining, Alfonsina grills a great steak (says the woman who seldom eats red meat) and has a charming atmosphere; the owner/bartender sometimes plays tango music and sings along. La Rita, which was recommended by Rick Steves book, offers very good food at an extremely reasonable price. The only truly bad meal I had was at the restaurant at the MNAC: overpriced, located in a freezing venue, the salmon was overpowered by the cheese with which it was stuffed, and the white beans were pureed and served cold, ick! 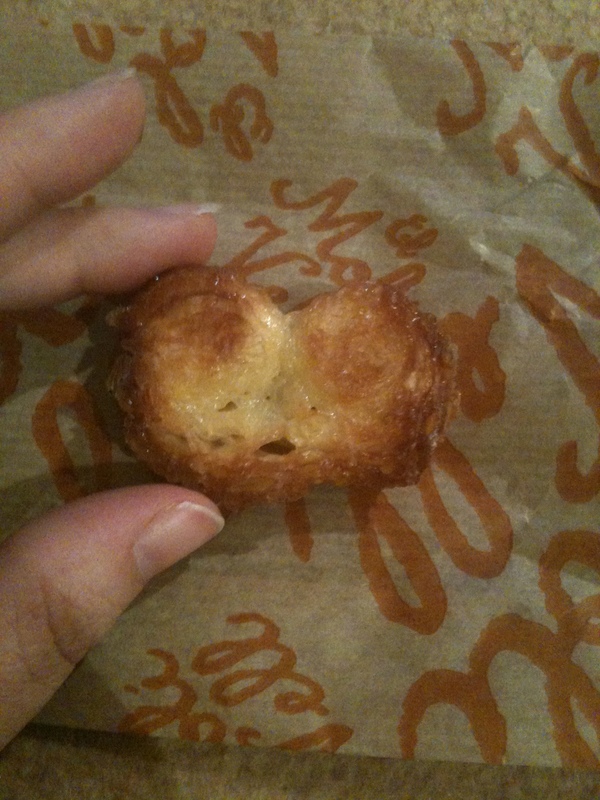 It also didn’t help that they were piped into shapes and sprinkled with purple sperm sprouts. The view from the restaurant down into the city was gorgeous and what diners really are paying for there. Further on the food note: I love Fanta. But only in Spain. And I was less than impressed by the hot chocolate I had at a highly recommended place in Eixample — it was too pudding-y, and tasted very starchy rather than chocolatey. Transportation: Once again, the AVE rocks. I’d tried it several years ago for Madrid to Sevilla and was impressed but was even more impressed on and after the trip from Barcelona to Madrid. The max speed I noticed was 301 kmph. Gorgeous scenery for the most part, and a clean, comfortable new train. Nicer than the Acela, which is the best the US has to offer for train travel. Guidebook: Not impressed by Rick Steves’ guide, but I am probably not the target audience. It’s written more for someone doing a big trip with only a couple days to spend in each city or region, so it only hits highlights and makes relatively few recommendations. It was helpful when figuring out which bus to take to Montjuic and Parc Guell, but generally I find that I prefer Lonely Planet and Eyewitness Travel books. Random observation: I bought a hat for The Chemist, who has begun collecting them, at a hunting supply store. The somewhat disturbing feature of the store was that although it purported to be a hunting store, most of the guns and manuals I saw were handguns. For hunting? Uh, okay. Hope he likes the hat.